Animal Place's Food for Thought campaign encourages animal rescue, wildlife, and environmental groups to adopt vegan menu policies for events. Now we need your help. Sign this petition to urge these organizations to align their menus with their missions. For 20 years, Animal Place has been lobbying organizations to adopt vegan menu policies and your signature will show that the public supports this change. Animal rescuers are on the frontlines rescuing animals in their communities and it doesn't make sense to then put animals on the dinner plate at community-based events. If a dog were treated in the same horrific way as pigs raised for their flesh -- castrated without anesthesia, kept in crates where they cannot even turn around, transported without food or water for up to 28 hours, the public would rightfully be outraged. Why shouldn't we extend the same compassion to all animals? Animal agriculture is one of the largest sources of worldwide greenhouse gas emissions, causes habitat fragmentation and destruction, results in loss of biodiversity and species extinction, wastes huge amounts of water, and pollutes air and waterways. Just as the environmental community strives to reduce their footprint by minimizing waste, using recycled paper, and saving energy, it makes sense to reduce the footprint of events by choosing a vegan menu. When farmed animals are on the menu at events hosted by animal and environmental groups, it sends a mixed message to the public. Please take action by signing and sharing this petition encouraging nonprofits to align their menus with their missions! Visit foodforthoughtcampaign.org for resources to help organizations adopt vegan menu policies. You helped us urge nonprofits to adopt animal- and earth-friendly menu policies for events! 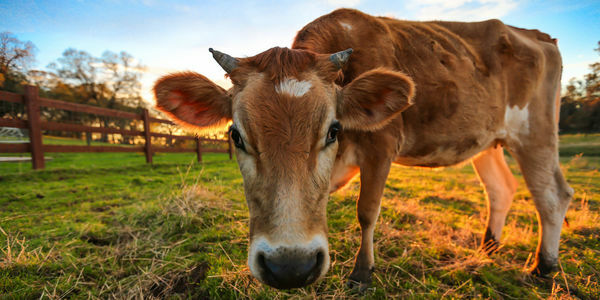 Since we launched this petition, 4 organizations have adopted meat-free policies, while an additional 5 organizations with existing vegan policies have endorsed our program! Animal Place’s Food for Thought team has been working with nonprofits for years to help develop menu policies. We need more help!